"My family is pretty special. I’m gay and I’m a nerd. I don’t think I could imagine being so proud saying that when I was in high school! My brother is adopted. He’s African American. He works as a pharmacy technician. He is the only human being on earth who is allowed to tickle me. My sister lives with my parents. She has Aspergers. She works at Xerox and she’s an avid runner, biker, and anything else you can dream up. My dad is a biologist. One of the high points of his year every year is when he brings a group of students to explore the Costa Rican rainforest. My mom retired from being a computer programmer a couple years ago. Now, she is a full-time textile artist. She makes amazing woven and knitted goods. All of us are so different, yet we make up a special family. One turning point in my life was taking a gap year after I graduated from high school to be an exchange student in Egypt. I got a scholarship from the U.S. State Department to live with an amazing host family in Cairo, go to a local high school, and study Arabic. The program was meant to last the entire 2010-11 school year, but the Egyptian Revolution started in late January and we had to go back to America in the beginning of February! During the time I was there I got to criss-cross tons of neighborhoods in Cairo, seeing awesomely historic buildings (not least, the pyramids!) and places of worship, seeking out the *very best and cheapest* falafel, fuul, and shisha the city had to offer, and trying pathetically to communicate with Egyptians in my garbled Arabic. Almost always, they were patient with me and delighted and amused I even tried! Probably the most extraordinary single experience, one of the high points of my life, was getting to visit the Siwa Oasis. This was all so different than the first sixteen years of my life in predominantly white upstate New York, so it got me realizing how much I still had to learn about the world. There are other experiences I have been so lucky to have. I got to spend a summer in St. Petersburg and Moscow trailing and working with Russian journalists. I took a year off from MIT to live at a Zen Buddhist monastery in central California. I spent a year working with a truly wonderful nonprofit in Boston called the Louis D. Brown Peace Institute, which is a center of healing for families impacted by homicide. I learned so much and grew so much there." How did you create your projects & what motivates you to work them? How do your projects combine science and art in innovative ways? "When I write music, there is always an indelible image the piece grows out of. Usually, because I love the human voice, what grabs me is a piece of text I can set to music! Not just poetry! I think there are many pieces of prose floating around in the vortex of cultural history whose fiery, prophetic power cries out to be expressed through the changed sense of time and broadening of attention only music can deliver. Sometimes, my pieces come from specific feelings, memories, or conceptions of people who have been important to me. When I write music and perform music what I want to do is tell a story. When you think about it, every artwork is a story made by someone and experienced by someone else. Art is important because of how it connects people. So I always think about how my experience creating art is linked with my audience’s experience hearing and seeing it. To stay passionate… take breaks and learn about something else, something totally new! Sometimes, you need to get your mind off of perfecting the tiny detail you’re working on! Lastly, I want to suggest there are greater connections between the intrinsics you need to be an artist and to be a great leader than many imagine. One feeds into the other! You need your creativity. You need to be endlessly sensitive to other people’s feelings and experiences. You need to read the surface and search for the subtext. Within an artwork itself, you need to intuitively and analytically approach issues of message, internal consistency, right and wrong, technique and mastery, and strategy. Sometimes, you need to blaze a path forward no one has yet asked you to, or even imagined! And, of course, no matter who you are or how successful you are, you need to be a good collaborator! I think of leadership as a special kind of art that comes from how you approach other people, how you listen, and how you communicate." "For me, a gique is someone who is legitimately excited about something inside their head and heart... and wants to share it with someone else to make the world more peaceful and beautiful! You have something--a kind of art, a type of machine, a new language, an unfamiliar way of thinking--and you derive ongoing satisfaction, enjoyment, wonderment, and/or fun from thinking about it and doing it. It’s an internal state married to an external orientation. By learning and being passionate about something, and communicating about it to other people through your words, ideas, and eventually inventions, performances, artistic creations, companies, and so forth, you’re improving the world as only a gique can. There are a number of things like that for me right now. One of my longest fascinations is J. S. Bach; I can’t get enough of listening to, thinking about, and playing his music. I first ran into it when I was 6, and I’m still going strong. Another love which I can’t stop thinking about right now is rock climbing. I only started getting really into it this summer (2017) but I’m a goner. Another ongoing passion is cooking vegetarian food and baking, especially bread. More broadly, I’m also engrossed in trying to understand how love, relationships, and sexuality work. It’s pretty confusing, right? And, perhaps in the purest sense of being a gique, I simply love talking about ideas with people and learning what turns them on. Finally, one unconventional thing I would say about giquedom is that your passions can change over time, and that’s ok. You’re a gique because of your love, your desire to communicate, and your drive to improve the world. What you love and how you express it can change at any time." "Sometimes, when I’m feeling overwhelmed or incompetent, I try to remember that my worth as a person doesn’t depend on what I accomplish. Rather, it’s who I am and how I treat others--how I relate to people--that’s truly important. So I say, be kind and compassionate and thoughtful - as hard as you can as much of the time as you can! As young people, we put pressure on ourselves and each other to be cool and act cool. When you think about it, though, in the long term and even right now, it’s more important to be gentle and sensitive to how other people are feeling and to be a good listener, especially if you are a guy. To get started on your ideas and be a happy, fulfilled person, seek out the people you feel really good around. Tell them sometimes how much you like and love them. Be open to developing deeper relationships of friendship and mentorship, because this is the most rewarding thing imaginable. Your connections with these people will keep giving and giving forever; this never gets old. I wouldn’t be a good Quaker if I didn’t say that the deepest and most powerful way we can relate to each other is through asking open-ended questions. Each person is a living treasure full of experiences, thoughts, and feelings. Ask somebody something out of genuine interest, insatiable curiosity, or warmth, affection, and love, and you can learn and feel amazing things. I’d also say I am really optimistic and proud of our generation and how we are going to change the world. Young people care about the environment, we care about a fair and equitable economy, and we care about consent and social justice. We believe everyone deserves a life free from oppression and violence, and I think that makes us pretty special. 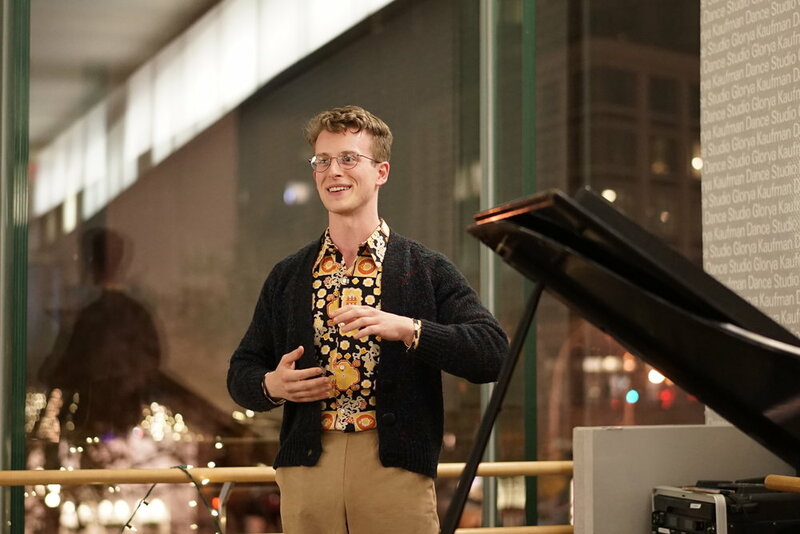 This means we’ll sometimes need to have fights with people in power to stand up for what is right, and that’s ok."
Click here to read a speech Daniel gave to the entire incoming class of music, dance, and drama students at Juilliard during New Student Orientation at the start of the Fall 2017 semester. It’s the first time a Student Council President spoke at the President’s Welcome.